My father was born in the back of a cart on the road from Myrtle Bank to Launceston on 7th Sept 1914 to Alfred Ernest Albert Blyth and Irene Elsie Towns. He married my mother, Margaret Ewart, at St Andrews Presbyterian Church in Launceston on 15th Feb 1947. 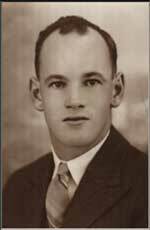 During his life Vin worked at many types of jobs from driving school buses and delivering mail, to installing milking machine plants along the East Coast of Australia. Around the time I was born he was a station hand for The McDonald Brothers at "Glencoe" NSW. We moved to Northdown in NW Tasmania in March 1960. Vin had bought an old school house and 25 acres of land, this became our home and is still in the family today. Vin died in Launceston in March 1980 after fighting a two year battle with cancer. He had only just retired and had been looking forward to a little bit of fishing and relaxation after a lifetime of struggling to make ends meet, while bringing up a large family.